Launching the framework and the new national outcomes First Minister Nicola Sturgeon said: ‘The Scottish Government wants Scotland to be the best place possible to live, work, grow up and study in. 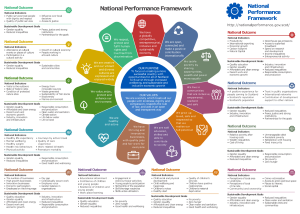 ‘This new national performance framework includes 11 key outcomes that the whole of Scotland can get behind and has been developed in collaboration with other parties and all aspects of society, including public and private sectors, voluntary organisations, businesses and communities. ‘As a government we recognise that economic growth is hugely important, but it must be matched by improvements in our environment, in people’s quality of life, in the opportunities available to people and the public services they have access to. ‘As a government and as a country, the challenge this new framework sets us all is to make progress in these areas to improve wellbeing across Scotland. COSLA President Councillor Alison Evison said: ‘I am delighted to add COSLA’s name to the National Performance Framework. ‘I want to add to the First Minister’s words and provide a clear message of support from Local Government for the new National Performance Framework and for the ambitions it sets out for a successful and inclusive Scotland. ‘We too share those aspirations for our country and the communities that we serve locally. ‘Particularly I want to underline the opportunity that the new Framework provides for both our democratically elected spheres of government in Scotland to work toward these outcomes through ever stronger and more meaningful partnership working arrangements.